Here we are, past the Ides of March, and it snows in Virginia. Again. About 12 flakes. Enough to shutter the schools. I’d better cook something. 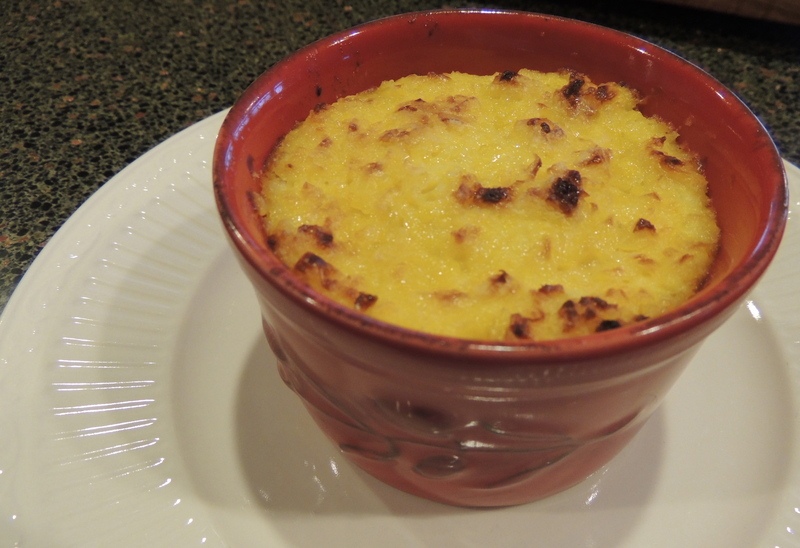 And I can think of nothing more comforting on a day of unscheduled togetherness than a hearty Chilean Pastel de Choclo. Pastel de Choclo translates literally to Corn Pie, which is a little misleading, since there’s more than corn to this pie. It’s the Chilean version of Sheperd’s Pie. A melange of ground beef, chicken, olives, raisins, hard boiled eggs, cumin, paprika and basil. All topped with a sweet corn puree. One of my very best friends is Chilean . . . her mom gave me a cooking lesson on how to prepare Pastel de Choclo. Lucky me, right? I’ll admit I was skeptical when I saw what was going into the pie — raisins, olives and hard boiled eggs?? Um? But don’t let the ingredient list scare you off. The flavors are delightful. And just the right amount of spice. Naturally, my friend’s mom doesn’t make Pastel de Choclo from a recipe, so I’ve had to search the Interweb for a version that’s close to hers. Because I’m a recipe girl. I’ve used this recipe from Sunset Magazine several times. Even the picky people at my house think it’s yummy. When I make this, there are NEVER leftovers. If I were smart(er), I’d remember to double the dang recipe! I make a couple of changes to the recipe. I use golden raisins — because they camouflage better in the meat mixture than regular raisins. (If you have picky people at your house, you know the importance of camouflage). And I omit the olives. I’m camouflaging raisins . . . olives are never gonna get past the kid sensors. Just before broiling, I sprinkle the tops of the mini-casseroles with granulated sugar. It makes for a nice, caramelized crust. My friend’s mom puts fresh minced basil in the pureed corn mixture. I was fresh out of fresh basil, but I did have some basil salt in my spice drawer, so I used a pinch of that. And of course you can’t have Pastel de Choclo without a Chilean red wine. Well, you could, but it voids the authenticity of your dinner. So I went downstairs to my wine cellar (read: basement closet), and made the horrifying discovery that I’m down to my last bottle of Chilean wine. I’ve already sent the distress signal . . . reinforcements are inbound. My last bottle? A Domus Aurea Cabernet Sauvignon Maipo Valley 2006. It’s wrapped in tissue paper . . . expectations are high. Wine Notes: This is a blend of 86% Cabernet Sauvignon, 7% Merlot, and 7% Cabernet Franc. Aged in French oak for 18 months, then another 18 months in bottle. The nose is weird. It smells like cranberries in a rusty bowl. Funky. Maybe it’ll blow off with some time in the glass. Flavors are cinnamon, eucalyptus and currant. Beautiful tannic structure. Finishes with notes of leather and tobacco. Minus the weird nose, I’m really digging this . . . wish I had more. Pairing Notes: It’s true what the wine pros say: If you’re eating ethnic food, drink ethnic wine. Why? Because it works. This is a fantastic match! No leftover Pastel de Choclo and no leftover wine . . . does it get better? A toast . . . Adiós, snow — here’s to Spring! ZOMG. The photo looks super delicious. Will check out the recipe now. Sounds delicious both the Pastel and the wine you paired. I am going to sound like a girl, but here goes, the label is pretty and I always have high expectations when something is wrapped in tissue! Your testing notes are fantastic!